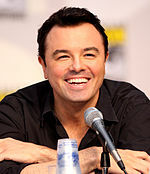 Seth MacFarlane sebagai Albert Stark, seorang peternak domba. Charlize Theron sebagai Anna Barnes-Leatherwood, istri Clinch Leatherwood yang berteman dengan Albert. Amanda Seyfried sebagai Louise, mantan pacar Albert. Neil Patrick Harris sebagai Foy, seorang pemukim Stump Lama dan pacar Louise pada saat ini. Sarah Silverman sebagai Ruth, pacar Edward dan seorang pelacur. Christopher Hagen sebagai George Stark, ayah Albert. Pada 20 Juli 2014, A Million Ways to Die in the West mendapatkan keuntungan sebesar $43.1 juta di Amerika Utara, dan $43.3 juta di wilayah lain, dengan total keuntungan di seluruh dunia sebesar $86.4 juta. A Million Ways to Die in the West dirilis dalam bentuk DVD dan Blu-ray pada 7 Oktober 2014. Skornya dikomposisikan oleh Joel McNeely. Soundtracknya dirilis oleh Back Lot Music pada 27 Mei 2014. Lagu tema "A Million Ways to Die" ditampilkan oleh Alan Jackson. Soundtracknya dirilis sebagai sebuah singel pada 29 April 2014. Seluruh musik diciptakan oleh Joel McNeely, kecuali yang ada catatannya. ^ "A Million Ways to Die in the West". British Board of Film Classification. May 19, 2014. Diakses tanggal May 20, 2014. ^ "Box-Office Preview: 'Maleficent' Set to Curse 'Million Ways to Die in the West'". The Hollywood Reporter. 28 Mei 2014. Diakses tanggal 29 Mei 2014. ^ a b "A Million Ways to Die in the West (2014)". Box Office Mojo. IMDB. 20 Juli 2014. Diakses tanggal 22 September 2014. ^ "A Million Ways to Die in the West". Media Rights Capital. Diakses tanggal May 26, 2013. ^ Collura, Scott. "Sarah Silverman for MacFarlane's A Million Ways to Die in the West". IGN. Diakses tanggal 9 Mei 2013. ^ Taylor, Amanda (10 Mei 2013). "'A Million Ways to Die in the West' gets summer 2014 release date". Entertainment Weekly. Diakses tanggal 11 Mei 2013. ^ Fox, Jesse David (May 11, 2013). "Neil Patrick Harris Joins Seth MacFarlane's A Million Ways to Die in the West". Vulture. ^ Shaw-Williams, Hannah (3 Februari 2014). "'A Million Ways to Die in the West' Trailer Has a Whole Lot of Death". Screen Rant. Diakses tanggal 5 Februari 2014. ^ a b "Rex Linn Joins Seth MacFarlane's 'A Million Ways to Die in the West'". The Hollywood Reporter. 30 Mei 2013. Diakses tanggal 10 Agustus 2013. ^ a b "Liam Neeson & Giovanni Ribisi Join 'A Million Ways to Die in the West'". Screen Rant. Diakses tanggal 10 Agustus 2013. ^ Quinlan, Erin (21 Mei 2014). "Neil Patrick Harris taps 'stache of talent in 'Million Ways to Die'". Today. ^ "Wes Studi to Be Second American Indian Inducted into 'Hall of Great Western Performers'". Indian Country Today Media Network. 19 April 2013. Diakses tanggal 27 Mei 2014. ^ "A Million Ways to Die in the West" (PDF). Universal Pictures. 9 Mei 2014. ^ "SethMacFarlane: Great day of filming with the hilarious Gilbert Gottfried @RealGilbert on #AMillionWays". Twitter. 21 Februari 2014. Diakses tanggal 22 Februari 2014. ^ Vejvoda, Jim (25 Maret 2014). "Universal Shows Off Fifty Shades of Grey, Lucy, A Million Ways to Die in the West and More at CinemaCon". IGN. Diakses tanggal 22 Mei 2014. ^ "@billmaher brought the laughs today in A Million Ways To Die In The West". Twitter. 29 Mei 2013. Diakses tanggal 30 Januari 2014. ^ Morgan, Maybelle (29 Mei 2014). "ELLE reviews A Million Ways to Die in the West". Elle. Diakses tanggal 29 Mei 2014. ^ "A Million Ways to Die in the West Blu-ray". Blu-ray.com. Diakses tanggal 2014-07-20. ^ "'A Million Ways to Die in the West' Soundtrack Details". Film Music Reporter. 13 Mei 2014. Diakses tanggal 22 Mei 2014. ^ Staskiewicz, Keith (28 April 2014). "Seth MacFarlane's galloping theme song for 'A Million Ways to Die in the West': Hear the Alan Jackson tune -- EXCLUSIVE". Entertainment Weekly. Halaman ini terakhir diubah pada 26 Oktober 2018, pukul 13.11.